All Web addresses mentioned were functional as of 1-8-16. From the Cumberland Gap to the Atlantic Ocean, this is Virginia Water Radio for the week of January 11, 2016. This week, we feature a lively crowd of guest voices, calling out their favorite example of a plant-like organism that’s not technically a plant, nor is it a single organism. Have a listen for about 30 seconds, and see if you can guess this combination of two, and sometimes more, organisms. And here’s a hint: If you’re thinking about a rocky, dry mountaintop, you’re LIKE-ly on the right track. 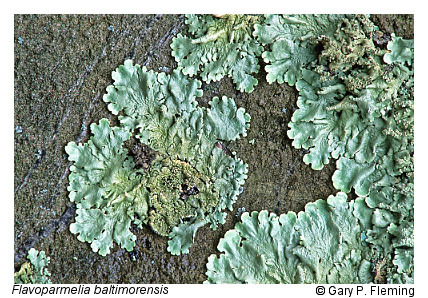 If you guessed lichens, you’re right! 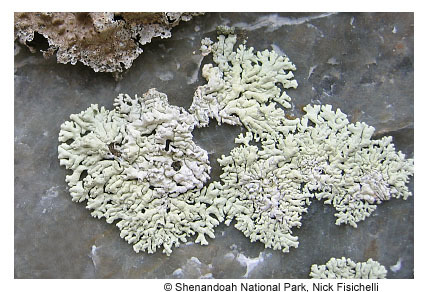 Those were the common names of 13 kinds of lichens found in Virginia, out of several hundred kinds known to occur in the Commonwealth and an estimated 14,000 species in the world. 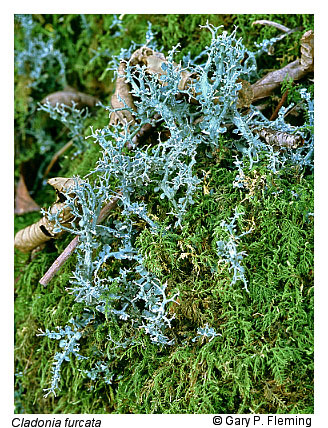 Despite some common names like Reindeer Moss, lichens aren’t a moss or any other kind of true plant. 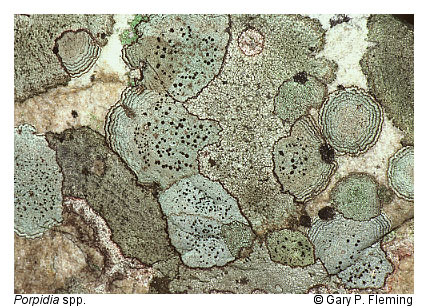 Lichens consist of fungus combined with another organism that can produce food through photosynthesis—either a species of algae or of organisms known as cyanobacteria. 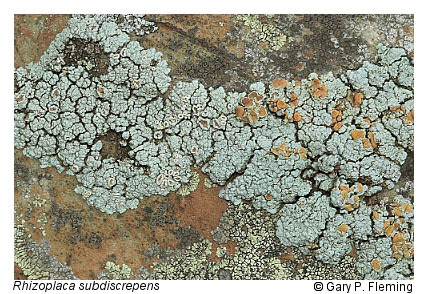 Lichens, therefore, are an example of symbiosis, meaning “living together,” where two or more different species exist in a close relationship that benefits one or both. 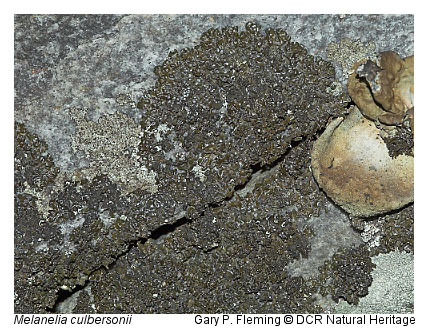 In lichens, the fungal partner gets energy from the photosynthetic partner; in turn, the photosynthetic partner gets a vegetative habitat that allows it to survive in challenging environments, particularly very dry ones, such as exposed rock faces. 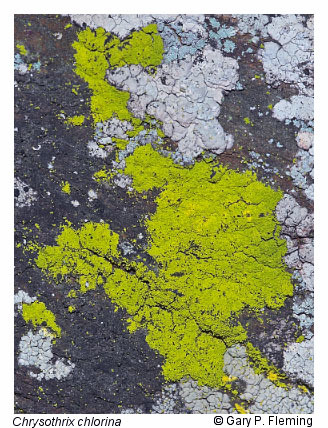 Lichens live from the poles to the tropics, on mountaintops and in streambeds, attached to rocks, bark, leaves, soil, insects, and even the shells of [some] Galapagos Islands tortoises. 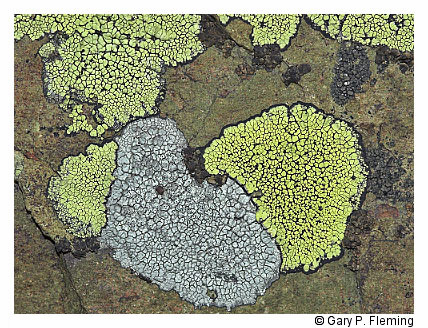 Water relations are a key part of lichens’ ability to live in such varied places; they’re noted for their ability to withstand drought for long periods, and for being able to absorb water directly from dew, fog, or highly humid air. 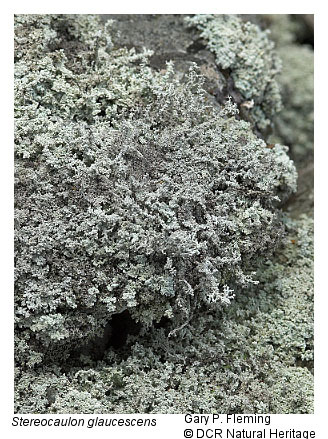 Wherever they’re found, lichens play key ecological roles, including as food for animals, in soil development, in nutrient cycles, and as nesting material. 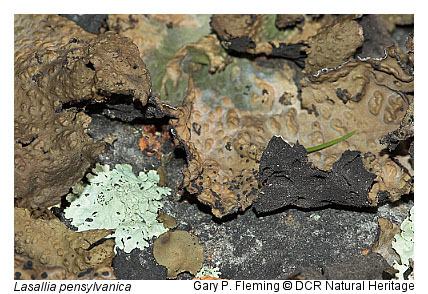 Humans use lichens, too, as food, clothing, dyes, medicines, and monitors of air pollution. 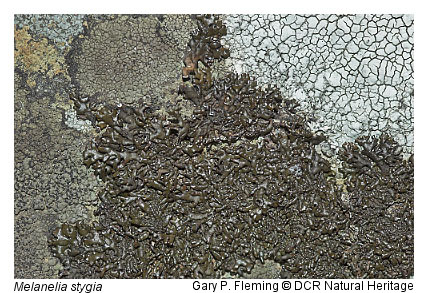 Thanks to several Blacksburg friends for lending their voices to this episode, and we close a few seconds of “The Rock,” by Timothy Seaman of Williamsburg, appropriate music for one of the water-challenged habitats where lichens live. Mealy Firedot [Lichen] – Caloplaca citrina. Mealy Pixie-cup – Cladonia chlorophaea. Mixed-up Pixie cup – Cladonia mateocyatha. 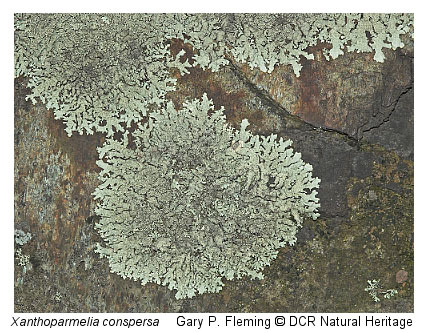 Candleflame [Lichen] – Candelaria concolor. Common Powderhorn – Cladonia coniocraea. 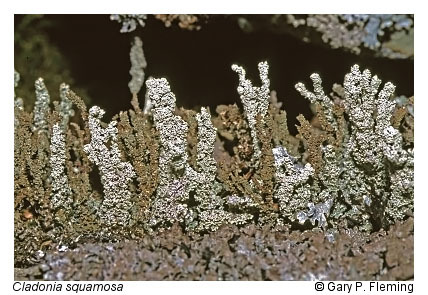 Powdery Goldspeck [Lichen] – Candelaria efflorescens. Common Stippleback – Dermatocarpon miniatum. Streamside Stippleback – Dermatocarpon luridum (found on rocks that are submerged at least periodically). Speckled Greenshield – Flavopunctelia flaventior. 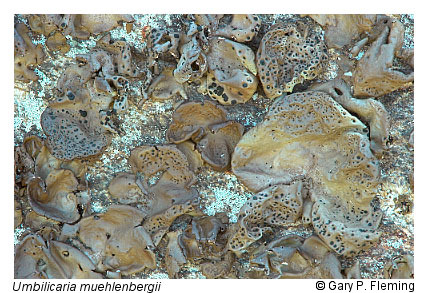 Bark Barnacle – Thelotrema spp. (several North American species). Old Man’s Beard – Usnea spp. (79 North American species). Waterfan – Hydrothyria venosa (found on rocks in mountain streams, including in the Appalachians). “The Rock,” based on a traditional tune and included on the 1997 album, “Here on This Ridge,” is copyright by Timothy Seaman and Pine Wind Music, used with permission. The recording also featured Paulette Murphy, Phillip Skeens, and Henry Smith. More information about Timothy Seaman is available online at http://timothyseaman.com/. Examples of lichens on rocks, wood, and bark along the Appalachian Trail/Kelly’s Knob section in Giles County, Va., Dec. 31, 2015. From Virginia Department of Conservation and Recreation/Natural Heritage Division, “The Natural Communities of Virginia - Classification of Ecological Community Groups,” online at http://www.dcr.virginia.gov/natural-heritage/natural-communities/nctivp. “Vegetation [in these areas is] almost entirely dominated by lichens and bryophytes [living on] exposed, minimally weathered boulderfields and associated massive outcrops on mountain ridges of western Virginia. ...These habitats, where few vascular plants survive, are typically densely populated by overlooked or cryptic species of lichens and moss. 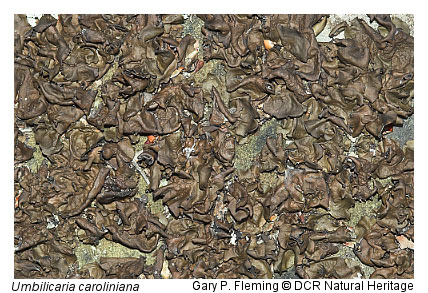 Massive, sheltered rock faces that are shaded and periodic wet often support large colonies of the umbilicate ‘rock tripe’ (Umbilicaria mammulata) one of the largest lichens in Virginia. 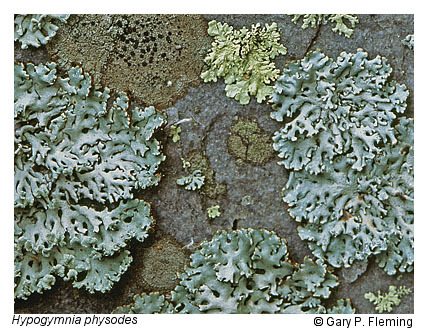 Other umbilicate lichens, shade-tolerant foliose lichens such as Flavoparmelia baltimorensis, and many crustose lichens may also occur. “...Rock tripes also dominate dry quartzite and sandstone boulderfields, with Lasallia papulosa and Lasallia pensylvanica characteristically abundant. Also common are golden moonglow lichen (Dimelaena oreina), Hypogymnia physodes, Physcia subtilis, Xanthoparmelia conspersa, Xanthoparmelia plittii, and Melanelia culbersonii, along with numberous crustose species. Flat surfaces and interstices that have thin deposits of organic matter often support broom-mosses (Dicranum spp. 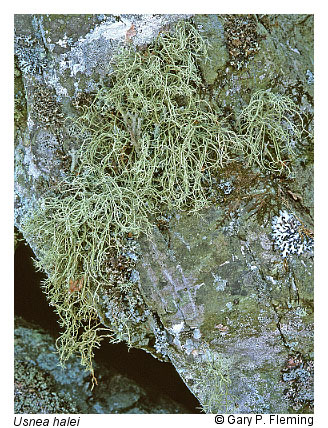 ), Hedwig's rockmoss (Hedwigia ciliata) and other bryophytes. 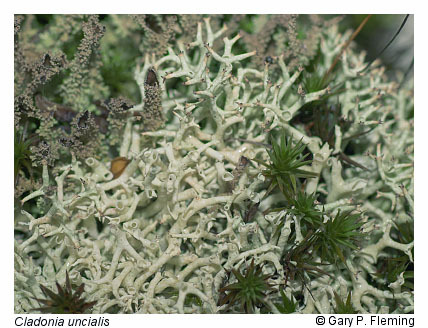 These, in turn, provide substrates for a variety of fruticose lichens, including Cladonia rangiferina, Cladonia uncialis, Cladonia crispata, Cladonia furcata, Cladonia macilenta, Cladonia ochrochlora, and Cladonia squamosa . 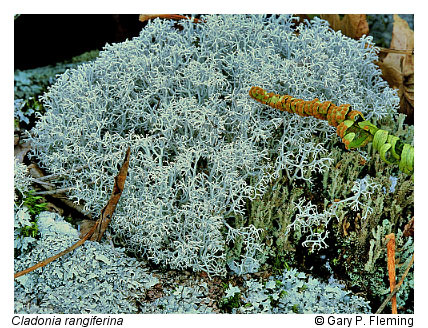 “...Rare sandstone and quartzite bounderfields above 1,200 meters(4,000 feet) elevation in the Ridge and Valley and Allegheny Mountains of Virginia and West Virginia support a different association of lichens characterized by the dominance of Umbilicaria muehlenbergii and the presence of boreal-alpine species such as Melanelia stygia and Arctoparmelia centrifuga. 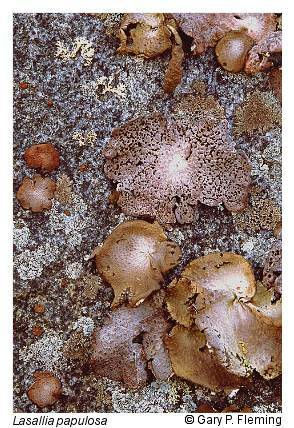 Irwin M. Brodo et al., Lichens of North America, Yale University Press, New London, Conn., 2001. Thomas H. Nash, ed., Lichen Biology (Second Edition), Cambridge University Press, Cambridge, England, 2008. 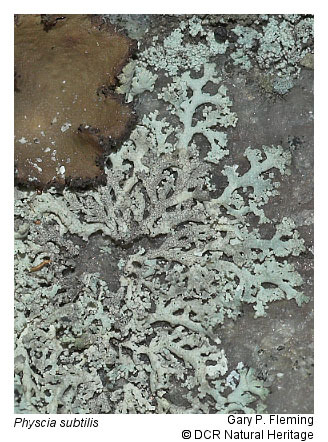 University of California Museum of Paleontology, “Lichen Life History and Ecology,” online at http://www.ucmp.berkeley.edu/fungi/lichens/lichenlh.html. 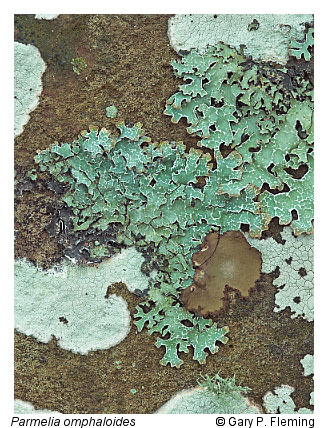 Brendan P. Hodkinson et al., “A Checklist of Virginia Lichens,” Evansia (published by American Bryological and Lichenological Society), Vol. 26, No. 2 (2009), pp. 64-88. All Water Radio episodes are listed by category at the Index link above (http://www.virginiawaterradio.org/p/index.html). Please see the “Plants” section for other episodes on plants, and the “Science” section for other episodes on algae. 6.7 – natural processes and human interactions that affect watershed systems; Va. watersheds, water bodies, and wetlands; and water monitoring. LS. 4 – organisms’ classification based on features. LS.9 – adaptations for particular ecosystems’ biotic and abiotic factors. BIO.4 – life functions in different organism groups.